I was recently hit by an error that when a user clicked on “My Settings” under his username to access his MySite, he had an Unexpected Error! System.Data.SqlClient.SqlException (0x80131904): The EXECUTE permission was denied on the object 'Admin_GetPartitionProperties', database 'Profile DB', schema 'dbo'. 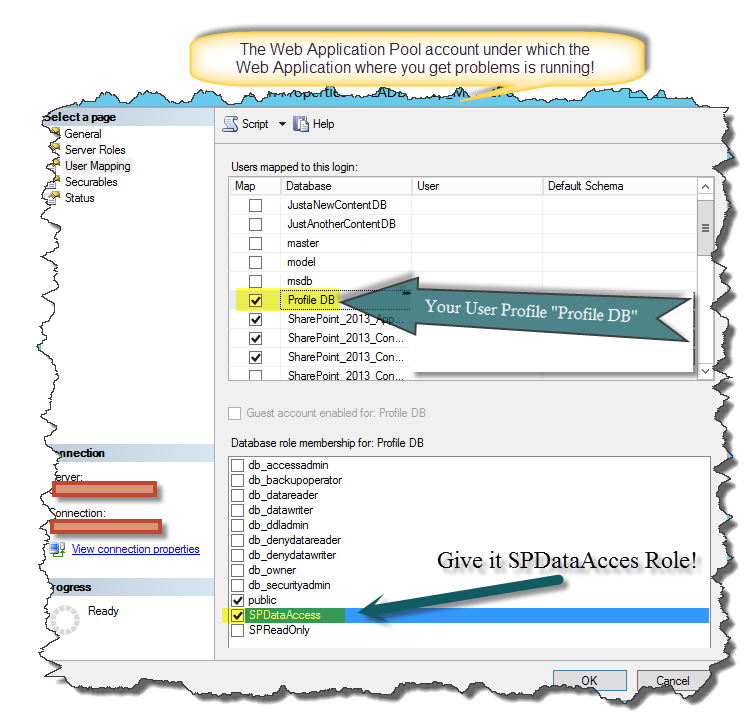 Failure checking user access permissions for User Profile Application Proxy 'User Profile Service Application'. Exception: System.Data.SqlClient.SqlException (0x80131904): The EXECUTE permission was denied on the object 'Admin_GetPartitionProperties', database 'Profile DB', schema 'dbo'. Immediately after, my top suite bar changed! The “My Settings” changed for “About Me” and I also had all the “Newsfeed SkyDrive Sites” elements added. I was then able to access MySite without problems! That fixed my problem and I hope it will help you fix yours as well! Product analysis by Vlad Catrinescu – requested by harmon.ie, but thoughts are my own. You might have heard it one thousand times, but one of the most important things in any SharePoint Project is User Adoption. The majority of the users embrace technology changes as long as it makes their life easier and the changes benefit THEM and not only the company. Forcing your users to do 3-4 extra steps for each document they work on daily only for the company to have it on SharePoint might in a lack of adoption. The old “standard” of transferring documents is sending them through email, mostly Microsoft Outlook. 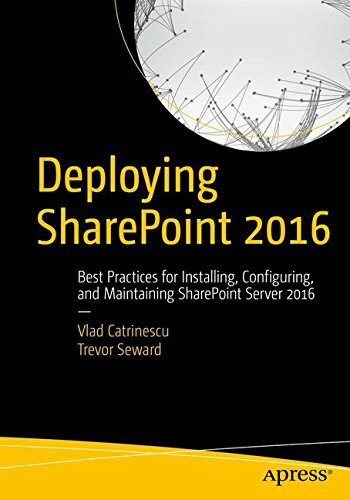 The best practice and what organizations aim for is users to upload the document to SharePoint and then send the link through email. It would be the perfect scenario, however since users need to do that extra step, they might just go the old way and exchange documents by email. And that’s where third party applications such as harmon.ie for Outlook come in! 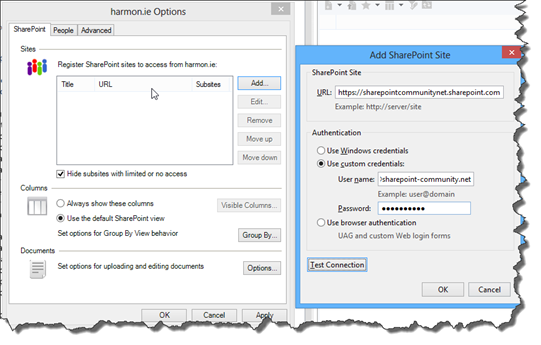 In this Blog Post, I will review the Free Edition of harmon.ie SharePoint Outlook Integration plugin and see how well it integrates with SharePoint and if it makes my life as a SharePoint user easier! Let’s first start with what this tool is. 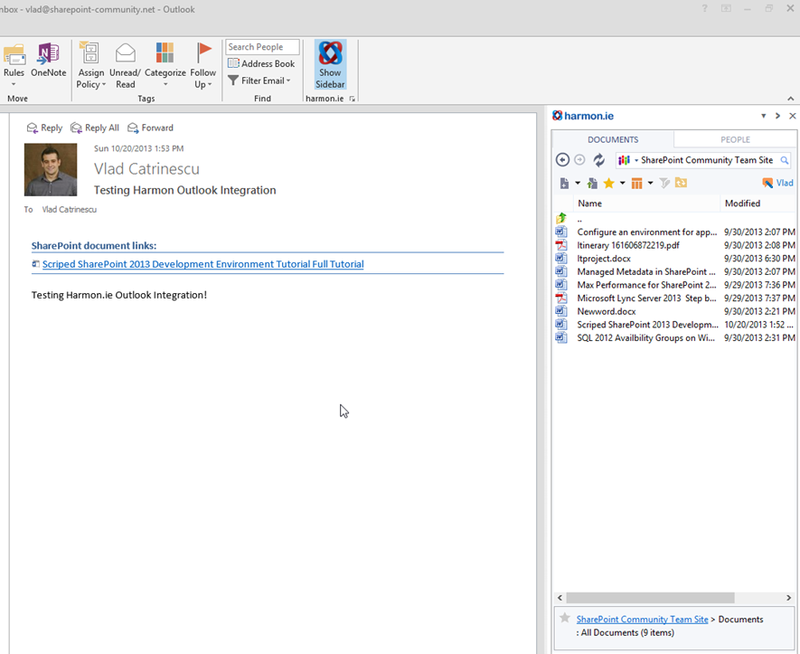 Harmon.ie for outlook is an Outlook Plugin that you can access directly from your top bar. I said eventually, because for it to show in there, you have to add your site manually before it can display it. However, with the enterprise edition, the network administrators can have a Centralized Distribution and every user will have a set of SharePoint Sites directly available in their sidebar. 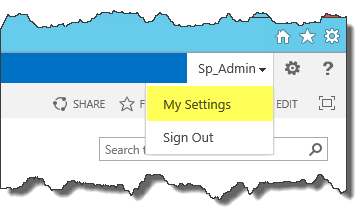 Once you click on the “Add Site” button you can enter the SharePoint Site you wish to add and select your authentication method. Since I installed it on my home PC, I selected “Custom Credentials”, however if your PC is in the same domain as your SharePoint you can simply use your Windows Credentials! Once we added our site we can play around a little and see how we navigate, but the big “wow” factor comes when we send an email with an attachment! 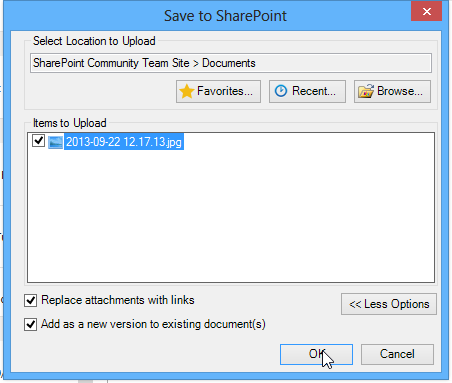 When we click send, we get the popup from harmon.ie that asks us if we want to upload the document to SharePoint and change the attachment from the email to SharePoint! In my opinion, that alone makes the product great, however let’s take a look at the other features the product offers. 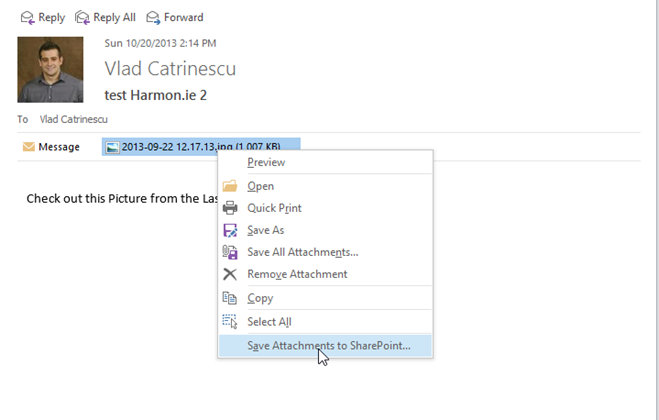 If ever a client or somebody else not using the product sends you something by email as an attachments, you can easily right click on it and send it to SharePoint. The product has plenty of other features such as document check out and check-in, “Show preview” that use Office Web Apps to show your documents. And of course you can have Versions…. All this directly from outlook! 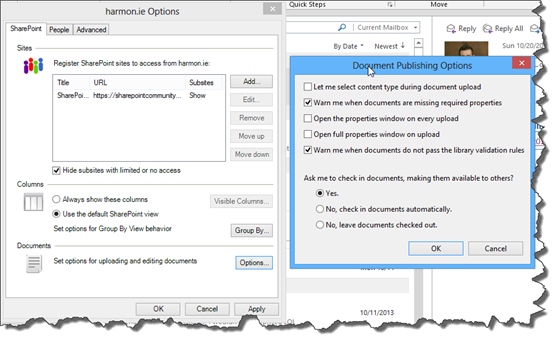 Continuing on Document Management, there are many things you can do with harmon.ie directly from outlook. For example, you can edit a documents metadata or content type without having to open the browser. 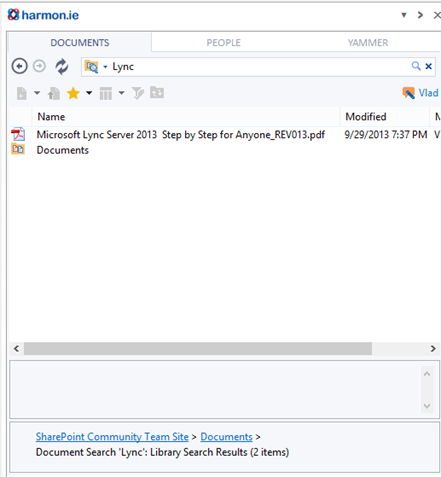 You can also Drag and Drop documents from the Desktop or from a mail attachment and they will be uploaded directly in SharePoint. While I am not showing screenshots of it, you can approve documents and publish Major versions of documents to your team! 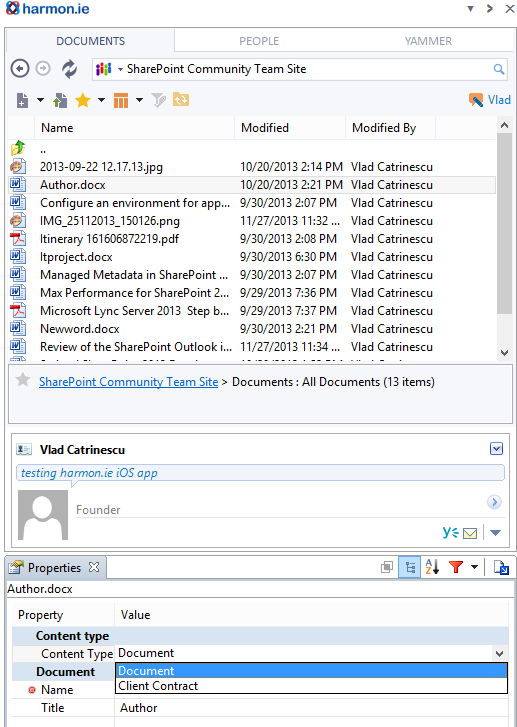 Furthermore, you can also create a new document directly from outlook! The New document icon is the “Document with a Plus”, however at the begging I had problems finding it since it was gray so I thought it was a “disabled” or not active button. 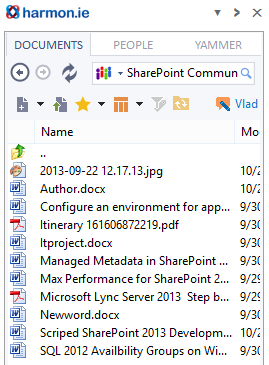 We also have the breadcrumb you are used to in SharePoint at the bottom of the add-in. You can then click on any of the previous titles to go back there. And we also have the ability to Search Documents. 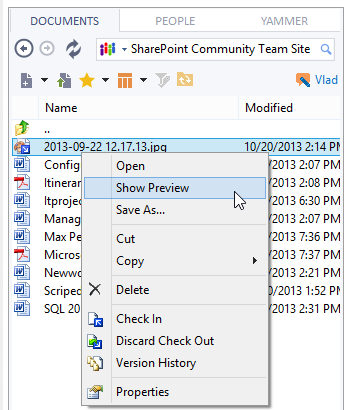 If you are not sure in which of your site or document library it is, you can Search it as you would do in SharePoint and find the relevant results! Lastly, one of the points I really liked is that it integrates well with Yammer. You can view and reply to discussions, and can easily switch between Networks and Groups. 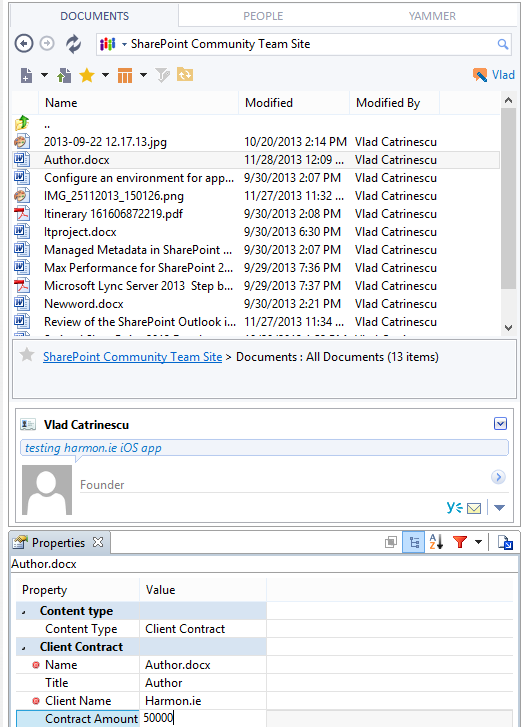 I found the harmon.ie SharePoint for Outlook add-in very easy to use and very rich in features. I had already tried an “Outlook and SharePoint” integration plugin before, however it was only to send documents from outlook to SharePoint… and that’s what I thought harmon.ie would do as well… but I was wrong. Actually replacing the attachments with the URL of the document in SharePoint alone would make the product awesome and increase user adoption. 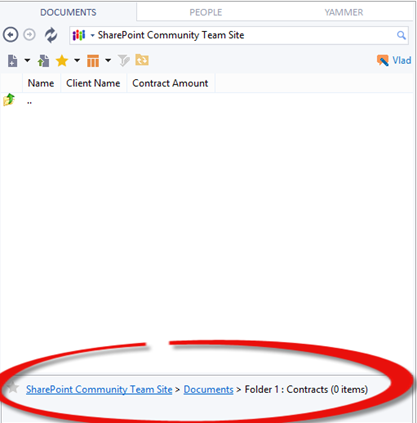 The fact that people can do pretty advanced SharePoint operations such as check out/ check in, change metadata and content types, approve documents , preview documents and… Yammer is the cherry on top of the cake. 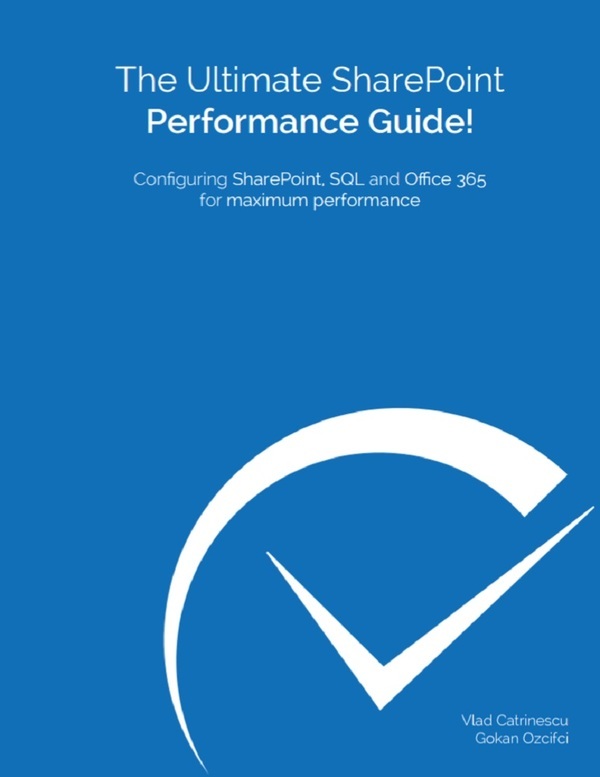 In my opinion, this product can clearly be a game changer in the adoption of a new SharePoint implementation and I won’t hesitate to suggest it to clients. To learn more about harmon.ie for Outlook please go to harmon.ie’s website. Microsoft is silently working and has made public a new certification about the cloud: Microsoft Certified Solutions Associate: Office 365. As Microsoft is increasingly trying to push companies to the cloud, IT pros will have to learn the migration process as well as learn how to help business get the most out of Office 365. The MCSA Office 365 will probably be the highest O365 certification level (no MCSE) and will provide IT professionals a certification that they are experts in the migration and administration of Office 365 business productivity services. Even though as you see, the MCSA Office 365 is not on the official MCSA List yet, I will try to share as much information as I can with you. 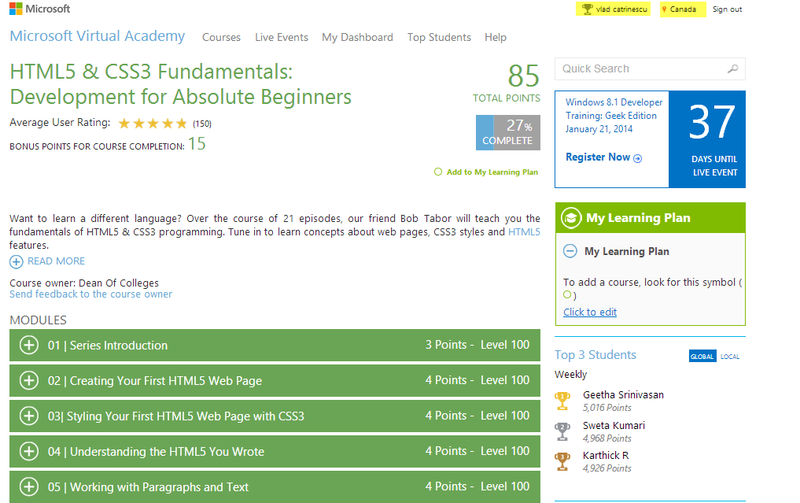 All this information is public, but hidden in the Microsoft Learning Website. 20346B: Managing Office 365 Identities and Services (5 Days) , however there is no info on it on the internet yet, and it’s the “B” version but there is no “A” version either! This Exam also has not one… but two MOCs listed on the website. One of them is the 20346A and the second one is 20346B. In my opinion this is either a typo from MS Learning, or in 5 days you could learn for both exams, which would actually be a good deal! Both Exams are currently in Development and should come out on February 17th 2014! Candidates for this exam are IT professionals who take part in evaluating, planning, deploying, and operating the Office 365 services, including its dependencies, requirements, and supporting technologies. Candidates should have experience with the Office 365 Admin Center and an understanding of Microsoft Exchange Online, Lync Online, SharePoint Online, Office 365 ProPlus, and Windows Azure Active Directory. This includes experience with service descriptions, configuration options, and integrating services with existing identity management and on-premises infrastructure to support the business requirements of an organization. So, if you ever fail the beta and you used the Second Shot, you can still take the Real Exam for free when it comes out! I think it’s a pretty sweet deal from the part of Microsoft! I think finally having a solid and planned O365 Certification is a good thing for the Microsoft Partner Ecosystem. Talking about MPN, I do believe that maybe in the future, this certification might become a requirement for certain competencies, or even replace the Office 365 Technical Assessment required in january for Collaboration & Portals. 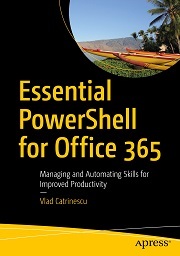 Furthermore I think that having 2 IT-PRO exams focused on O365 proves that O365 isn’t the “end of the IT-Pro”. In fact, the IT-Pro will be needed just as much, but we(I am an IT-Pro as well J ) will have to learn new skills and scenarios.